The election season is nearly over. The only thing that remains is the most important right and privilege of all Americans. While waiting in line today at the polls look at the faces of people who just voted. In its purist form, minus the millions of $ spent, minus the negative attacks punched and counter-punched, voting is truly a beautiful thing. The past couple of weeks have solidified this notion in seeing hundreds of early voters in Alaska lined up for hours in 10-20 degree weather. 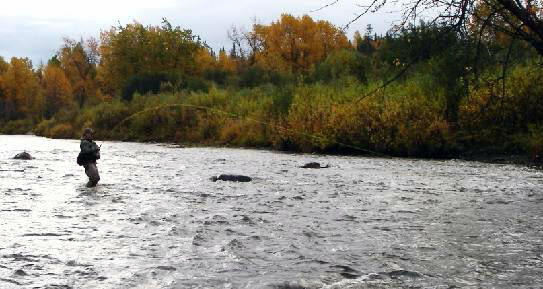 Like die-hard steelhead fishermen standing mid-river pelted by storms, voters come out for the hopes of something worth all of the effort. The powerful winds for the last eight long years has America straining to hold up an overhanging, top-heavy cornice. There are two distinct choices in this election. One choice would continue to blow the wind upward and take away from the foundation. The other will provide a constant force that encompasses the whole mountain. This choice will thoughtfully look ahead and protect the valley below from catastrophe. The beauty in voting lies in the fact that as an individual and as Americans, we can always strive to do better not just for ourselves but for our future generations. Top Ten Reasons Why David Letterman is Our HERO! Thursday night on Letterman, John McCain made his belated appearance. During the first few minutes, there was a sense of nervous decency between the two. 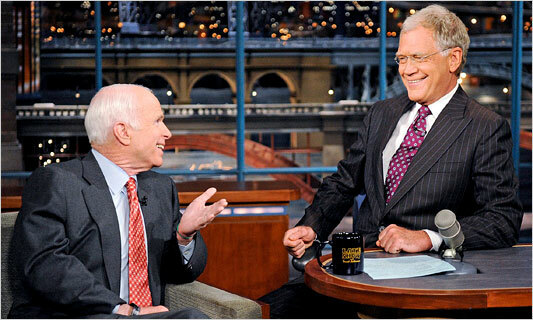 Dave seemed to have a hold on his understandable rage towards McCain for the senator’s bold faced lie to Letterman. His last scheduled appearance was suddenly canceled via phone by McCain just 1.5 hours before showtime. His reason is now well known in that he had to bail back to Warshington to lead his constituents in fixing the economic crisis. The problem is that McCain did not leave that day. He met with Katie Couric. He stayed the night in NYC. 10. Dave let McCain return to the Late Show after lying to his face. 9. Dave listened to McCain lie to his face again when McCain gave excuses about Obama’s alleged supporters shouting alleged hateful remarks towards McCain. 8. Unlike others in the mainstream media, Dave asked questions on our minds and did not let up. 7. Dave went pitbull on McCain about Sarah Palin and did not release his jaws even when McCain started squirming in his chair. When Dave asked if Palin was his first choice to possibly lead the country for the next 4 or 8 years or through the next 9-11 attack it was so clear during McCain’s response (‘absssolutely’) that he was lying. 4. McCain had no answer for ‘that one’. 3. The tension at this point during the grilling was so uncomfortably wonderful. Ok I admit, the list is not really a top ten list per se but an observation of a REAL interview under the veil of late night comedy. Letterman was masterful. The crescendo of the discourse successively drowned out McCain’s usual repetitive rhetoric. Peeling away the thicker layers of McCain’s onion, Letterman revealed the delicate truth. The audience was treated to the real John McCain with his real-time lies and his lack of depth in regards to his VP pick. The 15 minutes of McCain v Letterman was a classic bout of two heavyweights. Dave came out unscathed with McCain badly beaten and crawling to his corner. Nothing could save McCain this night. Nothing can save McCain in this election. America’s current state of healthcare is beyond the need of a bailout. Healthcare is a right and not a selective, top-down responsibility of government. As a 4 year volunteer at my local community health center I have been witness to an exponential influx of uninsured and working poor families who cannot afford skyrocketing healthcare costs. In last Tuesday night’s debate, Senator John McCain mentioned community health centers as one solution to America’s healthcare issue and a $5,000 tax rebate for people who can find (afford) insurance. The problem with McCain’s ‘plan’ is that it does nothing to address the current state of healthcare in which insurance and pharmaceutical companies and their respective lobbyists wield unprecedented power. In Alaska, one insurance company has an over 80% market share and enjoys a relative monopoly for setting costs. 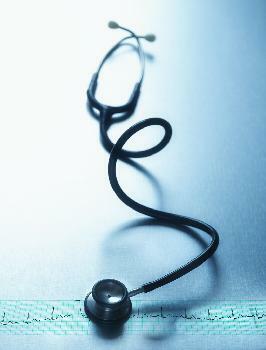 As a result, healthcare costs in Alaska are the highest in the nation. As a double whammy, no physicians other than our clinic in Anchorage are taking on new Medicare patients. None. The sad reality is that Alaska is bulging with oil tax revenue from record oil prices. In fact, Governor Palin and the state just gave every Alaskan a $1,200 Energy Rebate along with the yearly Permanent Fund Dividend of $2000. …“Palin, however, ignored the council’s recommendation to extend state health insurance to more children and pregnant women in poor and middle class families. She spurned that idea even though the federal government pays more than half the cost. In Alaska, only children in families earning 175 percent of the federal poverty level, or less, are eligible. For a family of three, that’s a maximum of $38,500. Most states offer such insurance to families with earnings at 200 percent, or double the federal poverty level — $44,000 for the family of three. In a time when Alaska is enjoying a record budget surplus, the satellite community health center located in the poorest neighborhood in Anchorage was forced to close due to a lack of funding. The now lone community health center which serves over 12,000 patients in Anchorage is overcrowded, underfunded and overworked. As a volunteer in the type 2 diabetes department (consisting of a staff of 2 including myself), we serve over 1,200 type 2 diabetics. Many conservatives mention the term ‘socialized’ when mentioning Obama’s healthcare plan. McCain is a product of ‘socialized’ medicine. The son of a military admiral, McCain also served in the military enjoying government provided healthcare. One of the main complaints some conservatives repeat ad nauseam is that government programs promote a hand-out society. In my opinion this backward mentality is one reason why we are in such a desperate state. George W. Bush’s tax cuts for corporations, insurance companies and the wealthy have reversed the progress and budget surplus enjoyed during Clinton’s presidency. John McCain’s tax plan not only mirrors Bush’s plan but further reduces taxes for the wealthiest individuals and corporations. The free market mentality of health insurance and medicine embraced by Bush and McCain have opened the doors for insurance and pharmaceutical companies to lobby and monopolize a ridiculously lucrative business which is bankrupting hardworking American families and small businesses. The patients of our community health center represent the failure of our society and of our leaders. The close to 50 million uninsured Americans are not looking for hand-outs. The millions of American children without health insurance and proper healthcare represent just how severe the situation is. There is no excuse for this blatant neglect. There is no reason to justify this abuse of America’s future. The patience and savings of Americans have dried up under a failed healthcare system. A John McCain/Sarah Palin leadership would further worsen the American healthcare crisis beyond the unimaginable mess of the Bush era. Couple this with the current global economic crisis and Americans cannot even tread water let alone afford the status quo. The lone vice presidential debate is over and who was left standing? The McCain/Palin ticket’s targeted lowering of expectations in the week leading up to the debate (‘Joe six pack’) may have had an effect on a small percentage of Americans. However, after watching the debate I kept my eye on the real issues affecting Americans (the economy, healthcare, education) and how clearly the questions were answered. Joe Biden was the clear winner. His gentlemanly handling throughout the debate was subtle and necessary. Biden’s most memorable moment came during his ‘I understand’ part of the debate in which he spoke about the death of his wife and child and of the challenges he faced as a single father. For a brief second every American including Palin fell silent after Biden’s self-effacing release of pure emotion. His touching tribute resonated with viewers. Biden’s moment epitomized both his strength as an individual and the strength of a country in which he rose from the deepest pain to a life worth living. The Middle and Lower Class Americans struggling with bills, rent, mortgages, medical expenses, food and gas witnessed the truth that is so difficult to find in politics today. Biden’s compassion for struggling Americans was a refreshing turn from Palin’s relentless rhetoric. Palin relied on superficial strategy accentuated with winks and down-home lingo laced throughout the much anticipated debate. Her reliance on her notes and memorized lines had no substance. At the end of Palin’s closing statement it was painfully clear that her answers were not hers. At the end of Biden’s close, one could see a candidate worthy of the vice presidency.